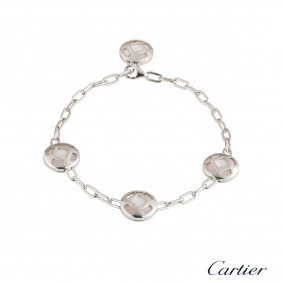 A iconic 18k white gold bracelet by Bvlgari from the B.zero1 collection. The bracelet features the iconic 3 spiral barrel motif, engraved with 'Bvlgari Bvlgari' set in between two engraved circular links. The bracelet features a lobster clasp and has a length of 8 inches with a gross weight of 6.70 grams.